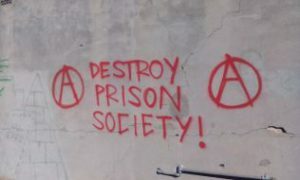 Today anarchist prisoner Alfredo Cospito begins a ten-days hunger strike against the censorship imposed to him by prosecutor Sparagna [/in charge of op. “Scripta Manent”/], which blocks almost the whole incoming and outgoing correspondence. Alfredo asks all comrades outside to send books, magazines, letters and printed materials in general, in protest and in support of his strike. Valentina, Danilo, Anna, Marco, Sandro, Daniele, Nicola friends, brothers, sisters, comrades were arrested and rearrested. I should narrate the same old story about another fabrication. Instead, I want to talk about the reason why they were arrested. Brothers and sisters were arrested because they attacked, they were tired of waiting, they ignored the decisions of the majority and took action. I remain optimistic and in high spirits because the logic of “1 + 1 = 2” tells me that the comrades who struck are still free, therefore they are able to strike again. The power does not repress randomly. Today it wants to isolate and to annihilate part of anarchist movement, a “small” as it may be it was able to break the chains that tied it to the “old social anarchy”. 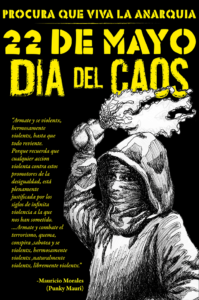 A social anarchism that in suicidal and compulsive way looks for “consensus at any costs”. Diluting continuously its aspirations. This vision that “never goes beyond” is very convenient for power, on the contrary it fears those anarchists who refuse that “consensus” ties their hands, because they believe that only out of the action (not made of abstract theories or searching-pursuing of “people”) can the strategy be born, the path to follow. I don’t want comment the “charges” and so-called “evidences”. The only thing I would say is that the brothers and sisters of FAI-FRI have always claimed with head held high, in front of black-robed pigs, their own merits, their own actions, taking the responsibilities, spitting in the pigs’ faces, as we did in Genoa. My main priority is not to get out of prison at all costs, but to get out with head held high without having denied anything of what I was, and I am. I will get out by hook or by crook, it will all depends on my strength, on my abilities, on the strength of my brothers and sisters outside, but definitely I will get out with head held high. 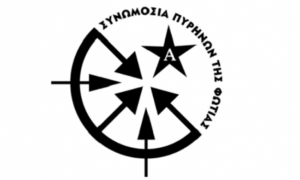 My ideal complicity goes to brothers and sisters of the “Cooperativa Artigiana Fuoco ed Affini”-FAI, to brothers and sisters of FAI-RAT(Rivolta Anonima Tremenda) and to brothers and sisters of Narodnaja Volja – FAI, whoever they are, wherever they are. 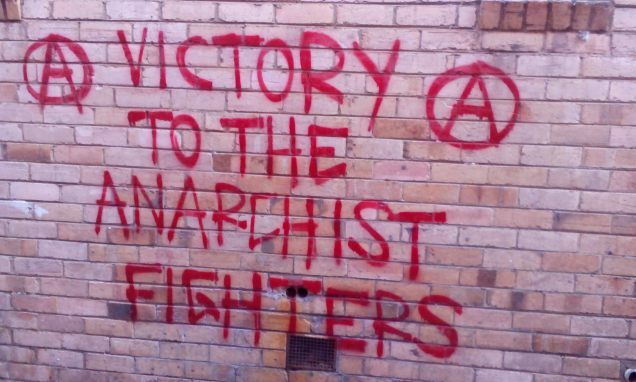 My ideal complicity goes to anarchism of praxis, which in new forms is rising in most of the world, after a long hibernation. C.C.F. – For Alfreddo and Anna – until we meet. 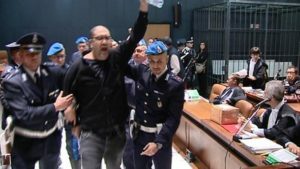 In Italy, comrade Alfredo Cospito since October 3rd and comrade Anna Beniamino since October 10th, are on a hunger strike against the isolation imposed on them and on the anarchists imprisoned for the attacks of FAI too (“scripta manent” operation). We know that the struggle against authority is unequal ..Nevertheless we choose the war for freedom instead of the peace of fear. Because we know that there are “free” people, which are more slaves than the prisoners, and alive people more dead than most of our dead comrades who fell in the battle for freedom. Because for every battle that we lose, a new one begins. For us solidarity is not simply a “touching” word, but a way of life, of becoming people with the dream as our measure. We stand by our comrades Alfredo and Anna with all our heart and mind, until our dream meeting..
We will analyze nothing and we won’t come out with sterile and bleak fanfares. Our solidarity with our imprisoned comrades in Italy is a given fact. In any case, the complex of the ascendent relationships is totally rival to us and we are in war with all its expressions, especially with its armed forms (repression, correction). 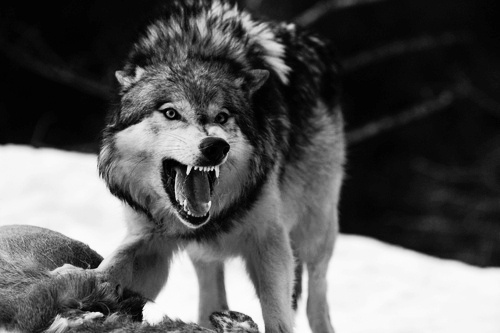 From authority and its flock we expect the worst, and we can’t treat in a different tactical way, if we want to cause even the minimum serious hurt. From our position, we perceive the hunger strike, except from means of resistance against repression, also as means of extortion and exploitation of the humanitarian mask that the states try to have in the eyes of the european cultural stage, and as this (means) we hope to have effect and cause the retreat of the enemy. Μετά την επιχείρηση ”Scripta Manent” των μπάτσων στην Ιταλία και τη σύλληψη των συντρόφων με κατηγορίες συμμετοχής σε δράσεις της FAI/IRF, τα συντρόφια έχουν μεταφερθεί σε 4 διαφορετικές φυλακές και βρίσκονται σε πτέρυγες υψίστης ασφαλείας, όλ# σε καθεστώς απομόνωσης και μεγάλου βαθμού λογοκρισίας. Ο σύντροφος Alfredo Cospito έχει ξεκινήσει από τις 3 Οκτώβρη απεργία πείνας, ενάντια στην απομόνωση και τους περιορισμούς που του έχουν επιβληθεί στην επικοινωνία του με τον Nicola Gai, και η συντρόφισσα Anna Beniamino έχει επίσης ξεκινήσει απεργία πείνας από τις 10 Οκτώβρη, ενάντια στην απομόνωση που έχει επιβληθεί σε όλα τα συντρόφια που συνελήφθησαν στην επιχείρηση ”Scripta Manent”, και σε αλληλεγγύη με τον Alfredo. ” Συνειδητά χρησιμοποιώ την απεργία πείνας σαν ένα εργαλείο που εκφράζει ένα ελάχιστο σημάδι αντίδρασης στις βαρβαρότητες που έχουν τις ρίζες τους στην αιχμαλωσία και την εξουσία. Όπως πάντα, διατηρώ την αναρχία στην καρδιά και το μυαλό μου, διαθέτω αγάπη και σεβασμό για όλους τους αδάμαστους συντρόφους εντός και εκτός των φυλακών, με την οργή στα δόντια μου και ένα χαμόγελο στα χείλη μου. 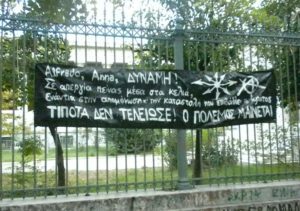 ” – Απόσπασμα απ’ την ανακοίνωση της Anna για την απεργία πείνας που ξεκίνησε. Δε θα αναλύσουμε τίποτα και δε θα εκστομίσουμε στείρες και ψυχρές φανφάρες. Η αλληλεγγύη μας στα αιχμάλωτα αδέρφια μας στην Ιταλία είναι δεδομένη. Σε κάθε περίπτωση, το σύμπλεγμα των κυρίαρχων σχέσεων μας είναι πλήρως εχθρικό και είμαστε σε πόλεμο με κάθε έκφανσή του, πόσο μάλλον με τις οπλισμένες του μορφές (καταστολή, σωφρονισμός). Από την εξουσία και το ποίμνιό της περιμένουμε τα χειρότερα, και δεν μπορούμε να συμπεριφερθούμε τακτικά αλλιώς, αν θέλουμε να τους προκαλέσουμε έστω το ελάχιστο σοβαρό πλήγμα. Από πλευράς μας, αντιλαμβανόμαστε την απεργία πείνας, πέρα από μέσο αντίστασης ενάντια στην καταστολή, και ως ένα μέσο εκβιασμού και εκμετάλλευσης του ανθρωπιστικού προσωπείου που προσπαθούν να περάσουν τα κράτη στο ευρωπαϊκό πολιτισμικό στερέωμα, και ως τέτοιο (μέσο) ευελπιστούμε να κάνει τη δουλειά του και να προκαλέσει την υποχώρηση του εχθρού. 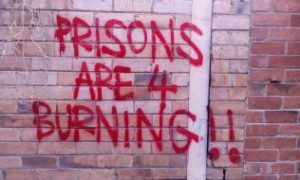 As of 11th October the comrades arrested as part of the operation “Scripta Manent” have been transferred to 4 different prisons and are all in High Security AS2 sections – all in isolation. They are all subject to censorship in prison – 7 of the comrades have official censorship – but they have all received at least some post and telegrams. As far as we know, they cannot write to each other but we know that Anna received a telegram from Nicola. The comrades inside have asked to receive books, communiqués and as much news as possible. Since 3rd October, Alfredo is on hunger strike against isolation and the restrictions that have been placed on his contact with Nicola. He was put in isolation over one month ago due to his act of solidarity with the CCF and for the operation Scripta Manent. Since 10th October Anna Beniamino has also begun a hunger strike against isolation inside. 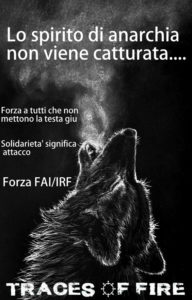 On the 30th of August Alfredo damaged the glass partition windows of the interview room in the high surveillance section of Ferrara prison in solidarity with the prisoners of the CCF who were recently sentenced to more than a hundred years in prison for an attempted escape.